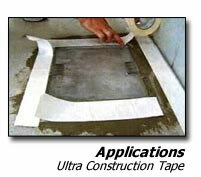 Ultra Construction tape is a 2" double sided textile re-enforced self stick tape. It is VOC free, free of odors, carcinogens, out-gassing and is totally safe for people. The adhesive is acrylic based, plasticizer resistant, contains no formaldehydes and has unrestricted waste disposal. Ultra construction tape has the same adhesive strength on both sides. Ultra Construction tape is used as a re-enforcing tape which is applied directly to the sub-floor and under the full surface Ultra or Ultra Electronic releasable tapes for re-enforcing seams or perimeters of carpet over carpet installations. It is generally not required for solid vinyl.